Early on Wednesday, Aug. 24, 2016, two vans left PAWS Chicago to make the 13+ hour drive down to Southern Louisiana to rescue dogs and cats following the devastating floods that have hit the area over the past few weeks. 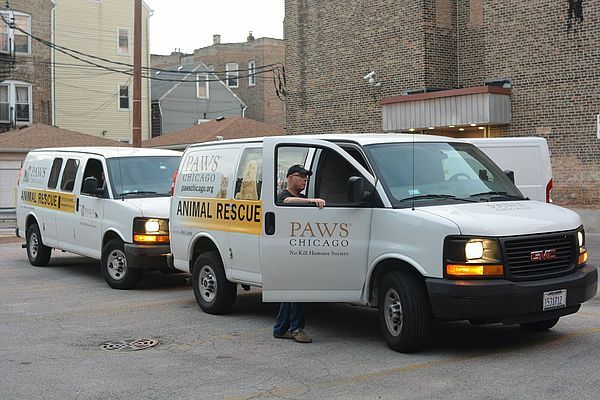 The PAWS team transported dozens of cats and dogs from local shelters back to the PAWS Chicago Medical Center. The pets rescued by PAWS Chicago alleviated some of the overcrowding at shelters in the areas impacted by floods. PAWS Chicago's efforts were focused on pets who were given up by their owners or had already been in local shelters before the flood hit, to make room for the influx of animals from this natural disaster. PAWS partnered with the St. Tammany Parish Humane Society and the Livingston SPCA. Before sunrise on Friday, Aug. 26, 2016, PAWS Chicago volunteers returned to Chicago following a 16-hour drive from Southern Louisiana carrying 26 cats and dogs who were rescued following the devastating floods that hit the area over the past few weeks. Many of the animals will require foster homes, including dogs who are heartworm positive, while they receive treatment. Once the animals are medically cleared, they will be available for adoption. Please check back to this page and PAWS Chicago’s Facebook page for the latest on this rescue effort. See some of the rescued animals arrive in Chicago on CBS Chicago, NBC Chicago, WGN TV and Chicago Tonight. Learn more about PAWS Chicago's disaster response program here. Foster: Help make space at our Medical Center by giving a rescued cat or dog a temporary, loving home. We have already begun placing animals in foster homes. Sign up to become a PAWS Chicago foster today. Adopt: Every animal at our Adoption Center has a rescue story of his own. Welcome a loving cat or dog into your family and experience the joy they bring to your home. When you adopt, you not only save the life of that animal, but also that of another who can be rescued. Meet your new best friend today. Volunteer: Donate your time. Volunteer to save lives.